In her professional career, Ella Mancini plays matchmaker at Two Love Lane but, in her personal life, she takes the stage at the Dock Street Theatre. Now she has a chance at a new role in a Hollywood movie that happens to be filming in Charleston—one that features a big-name actress, Samantha Drake. Long ago, Ella passed up a major audition while awaiting a marriage proposal. Not only didn’t she get the role; she never got the ring, either. Instead, her boyfriend Hank went on to become a huge film star…leaving her, and all her dreams, behind. But now Hank’s back in Charleston, cast as the male lead in the same movie Ella’s in. In spite of the dramatic tension off-screen, he and Ella try to stay cool onset. 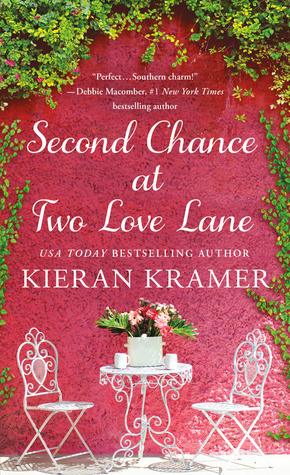 But when their old feelings start to heat up—at the same time leading-lady Samantha tries to play cupid—all bets are off. How can Hank convince Ella, after all this time, that she’s the one he really wants to be with in real life—and that some happy, rom-com endings really can come true? The Bottom Line: In the interest of fairness and complete honesty, I purchased and read the first two books in this series prior to diving into this installment of the series. Furthermore, I will be the first to admit, on occasion, I love a sappy, sweet, give me cavities and/or a diabetic coma kind of read, but I think this book (and series) are a bit over the top, even for me. I have absolutely no complaints about the mechanics of this read as the author’s technical writing skills and editing are quite good. What somewhat put me off this book (and the series) are the main characters and quite unrealistic plots. Each story, including this one is a bit too far-fetched, even for fiction. I’m willing to go a long way down a path with an author, but this path has too many improbabilities for me to feel this could be real. With all that being said, I did find one bit of this book (and series) utterly and completely wonderful. Ms. Thing!!!! Even though Ms. Thing is a relatively minor character in the book (and series), she has a huge personality and an even greater impact. As the matriarch of the group, Ms. Thing provides emotional support to the women and clients of Two Love Lane. She also provides tea, homemade cookies, sage advice, loyalty, friendship, and genuine care and concern. Upon reflection, I think I only read all three books because of Ms. Thing and her big, bright, beautiful personality. If you’re a fan of the super-sappy, super-sweet reads then I’m going to recommend this series to you. However, if you like a bit possibility and probability in your romantic fiction, I’m going to have to steer you in a quite different direction.